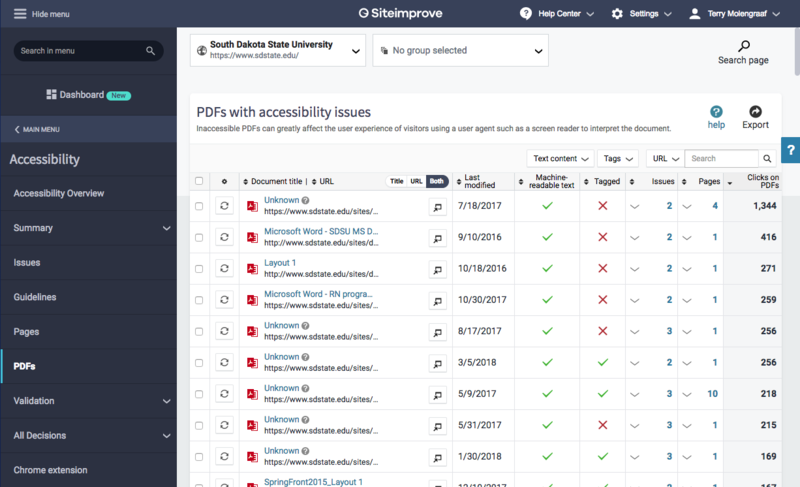 By default, Siteimprove lists documents with accessibility issues by most clicked. No machine-readable text – a scanned document. Is the content of the file current or should it be removed from the website? Should I take this content from the PDF and put it into a web page? If this must be a PDF file, do I have access to the original file from which it originally was generated? NOTE: It is always easier to create an accessible PDF document if you start with a fully accessible document in the authoring software, like MSWord. For more information on how to create an accessible document using MSWord, please refer to the Accessible PDF Documents page. For Logical Reading Order, go to the Tags Tool and "Walk the Tree"
Fix any missing, mislabeled, incorrect and empty tags. Tip: When making changes with tags in Acrobat it easy to make a mistake and there is no undo button, therefore Save and SAVE often. After you have completed Step 4 do a final Save and congratulate yourself, you have an accessible PDF document. Check the checkbox and Click Replace at the bottom. Due the server cache, Siteimprove will not update the results of your work immediately (Can take several hours for the server cache to clear and begin displaying your new file). Note: It is easy to fall into the trap of just fixing issues with a document. Keep in mind, however, the aim is to give individuals with disabilities the ability to easily consume the content of a document as those without a disability.